On annual Kashmir Day on February 5, Islamabad reiterated ‘Kashmir and Pakistan are one soul in two hearts’. But much before the day would broadcast Pakistan’s support for Kashmiris, Muslims of the Valley and Jammu had long campaigned and suffered for the creation of Pakistan. When the Muslim League adopted the epoch-making resolution in March 1940 at its Lahore Session, the conceited Congressmen would deride the move as impracticable and absurd. But for the thoughtful Hindus, the resolution demanding the partition of India on religious basis was deeply perturbed. In the run-up to the Partition, the resolution saw Muslims feverishly supporting the idea of Mumlikat-e-khudadad — even ardently engaging Muslims of the Dogra-ruled Jammu and Kashmir. For many of them—the revolutionaries of the day—the Lahore Resolution came as a new lease of life to Muslim Conference (MC), brazenly converted into National Conference (NC) by Sheikh Mohammad Abdullah earlier. Many disgruntled status quoists were still batting for MC’s last vestiges, forcing the likes of Chaudhari Ghulam Abbas into a political hibernation for two years. Among other things, that popular Muslim Jammu leader’s tilt towards Muslim cause in the Indian sub-continent was well known—something, sourly despised by Sheikh and his party. Interestingly, Abbas had earlier thrown his weight behind Sheikh Abdullah’s move of changing MC into NC with conditions laid down by both the leaders. Then the outside impact was more on Jammu region than Kashmir valley. With time, however, Abbas grew disillusioned with NC’s activities and understood how Sheikh Abdullah associated NC with the ideology of Indian National Congress, which was against his basic principles. He resigned and returned to his parent organization, MC. To make MC strong, Abbas and other party members worked for the Pakistan cause in Jammu and Kashmir at a time when Muslims of the Hindu Dogra-ruled region thought that their better future lay with Pakistan. Even Abbas as MC President made it clear in the party’s first session in 1942 that the aim of their organization is to support the Pakistan movement and that they’ll make endeavors to fight for its cause. Back in valley then, the Mirwaiz of Kashmir Molvi Yusuf Shah and Muhammad Yusuf Qureshi—sidelined by Sheikh and his NC cabal—supported the move. These people went on to play a momentous role in gaining support for the Muslim League in Kashmir. MC’s revival on Kashmir’s political scene clubbed with Qaid-e-Azam Muhammad Ali Jinnah’s Kashmir visit dented the popularity of Sheikh’s NC. To salvage its image, the party resorted to propaganda—that too in the times of Nazi propagandist Joseph Goebbels—in the Jammu region. But Abbas’s sturdy support base in Jammu thwarted such attempts. In the changing dynamics of the world, where great regimes were perishing and the imperial sun was about to set, NC began taking refuge in pro-people stand. This political posturing came at a time when the political rivalry between Muslim League and Indian National Congress had become an un-ending fact in British India. The resultant political atmosphere naturally impacted 560 odd princely states in the sub-continent. The leaders of Congress thought better to engage the people of princely states and enlist their support in the freedom struggle of India. They actually launched All India States Peoples Conference in 1927 to disseminate their ideology and program. The Muslim League in reaction created All India States Muslim League to save the interests and rights of Muslims in the Indian sub-continent. Nawab Bahadur Yar Jung was chosen as its President because he belonged to Hyderabad, one among the princely states. Back in valley, the camouflaged NC would still draw flak for shattering Muslim unity. Much of this rage would stem from the fact that not many non-Muslims had joined NC—the alibi which Sheikh and his coterie would float in their defense to rechristen MC. For many MC diehards, Sheikh had just ended the movement, which had given them a voice against the oppressive Dogra regime. At the fag-end of his life, such blame—that he wrecked the movement—would return to haunt Sheikh after his party binned the Plebiscite Movement by entering into a notoriously famous accord with Indira Gandhi-led New Delhi. MC’s fall had led to the emergence of All Jammu and Kashmir Muslim League (AJKML). After Sheikh opposed the party, Kashmir Muslim Students Union passed a resolution in Aligarh Muslim University in 1939, criticizing Sheikh’s hostility towards Muslim League. There were a lot of supporters of Muslim cause among teachers and civil society which led to the entry of many students in Muslim League. Later some AJKML members would participate in the historic Lahore Resolution. In that session, Prof M.A. Hafeez was chosen All India States Muslim League’s (AISML’s) J&K representative to carry forward the Pakistan Movement in J&K Muslims. Both AJKML and AISML worked together to strengthen the idea of Pakistan in Jammu and Kashmir. Soon, as many AJKML members were appointed as government employees, the party merged into Chaudhary G. Abbas-led MC, which enjoyed full support of Muslim League and was strongly backed by Qaid-e-Azam, who had met Abbas during his 1936 Kashmir visit. Despite leading MC, Abbas had become strongly affiliated with Muslim League. As the Pakistan movement gained pace in the mainland India, people in J&K flocked to become Pakistan foot-soldiers. Even Sheikh Abdullah’s supporters were influenced by Qaid-e-Azam’s sway over Muslim politics. In Kashmir, the Pakistan slogan became more popular after Madrasa students returned from India to galvanize support for Pakistan movement. Instead of Islamic sermons, they would preach the significance of the creation of Pakistan. Amid rising Pakistan movement, J&K students propagated its ideology — despite the ruthless Dogra regime and NC rank and file mounting their Pakistan hate-offensive on civilian backers. The state backlash became blatant on 6 June, 1944, when Justice Ganga Nath, President of the Royal Commission, angrily told Agha Sher Ali in public sitting that “to talk of Pakistan in Kashmir is sedition”. In the times of great revolutions, however, no coercion could damp the spirit for the Muslim homeland. Then the members of Kashmir Muslim Students Union (KMSU) would assure Qaid-i-Azam that ‘they’re committed to the cause of Muslims’. On every 21 April, KMSU would observe the Iqbal Day by making passionate pro-Pakistan speeches. The student body received both moral and intellectual support from S.P College faculty, including Prof Ahsan-ul-Haq, Dr Nazeer-ul-Islam, and Prof Raja Maqbool Ahmad Khan. Even commoners with ideological tilt towards Pakistan came forward with their support. In May 1942, on Qaid-i-Azam’s appeal, KMSU collected fifty rupees to fund the cause of Pakistan. 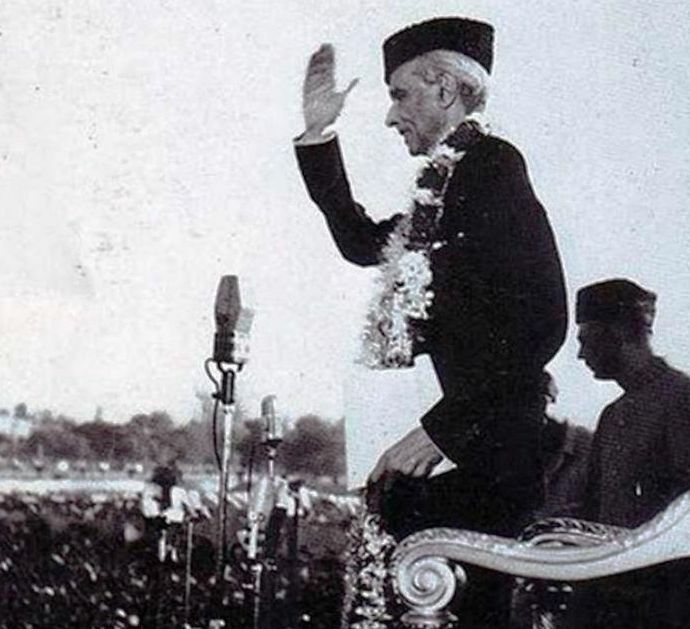 Soon on 14 July, 1942, the KMSU leader K.H Khursheed—who would later rise to become private secretary of the great Muslim leader of the sub-continent, Qaid-i-Azam, Muhammad Ali Jinnah—made a fiery speech in favour of Pakistan in the premises of S.P College and appealed about the collection of more funds for its cause and creation. In November that year, Khursheed along with Ghulam Rasool Zargar attended the annual day of Punjab Muslim Students Union. The occasion was graced by Qaid-i-Azam himself, along with Chaudhari Ghulam Abbas and other Muslim leaders. Later Qaid-i-Azam would give green crescent flag to Khursheed as an honour for KMSU’s work in Kashmir for Pakistan’s cause. But after the creation of Pakistan, many such Kashmiri Pakistan diehards were sidelined, jailed, exiled — and even reduced to ‘traitor’ beings by Sheikh Abdullah’s emergency government and his supporters. His Pakistan bashing would later make him behave like a sitting duck over the Jammu Muslim massacre. Sheikh’s detractors say that his indifference towards the pro-Pakistani Jammu Muslims apparently came because Jammu Muslims had always discouraged his designs besides had never considered him as their leader. But today as Kashmir continues to echo with Kashmir Banega Pakistan slogans, many are reminded how the legacy of Pakistan movement is very much alive and kicking in Kashmir. Working on ‘Contested Legacy of Sheikh Abdullah’, Yasir Bashir is a Research Scholar in the department of History and Culture, Jamia Millia Islamia, New Delhi. Views and opinions expressed in this article are those of the author’s and do not necessarily reflect the editorial position and policy of Free Press Kashmir.